Whether you're entranced by Viggo Mortensen's Renaissance Man musings or bemused by his born-again earnestness, one thing's for sure: he's on a mission to spread the gospel according to Aragorn. When Viggo Mortensen ambles into the parlour of New York's luxurious Regency Hotel, he's completely unrecognisable and surprisingly inconspicuous, despite his statuesque frame. Without his warrior's beard, wild mane of hair, chain-mail armour, sword or even shoes (he's barefoot), he looks more hippie than hip superstar. In fact, it's only after Mortensen flops down on the sofa and stars eulogising about living and working in New Zealand for the past few years while filming Lord of the Rings, that I belatedly realise it's him, rather than his publicist! To fail to recognise one of the biggest film stars of the millennium, in arguably the most momentous trio of movies yet made, is a staggering oversight. But Mortensen's physical transformation from Aragorn, his superhero alter-ego, to his own, humble self is extraordinary - as is his exceptionally un-star-like personality and poise. Rather than the brash demeanour you might expect of a Hollywood star, Mortensen is remarkably humble; affable and so mellow you worry he could drift off into a stupor at any second. His voice is a raspy whisper, neither terse nor bored, and there are no histrionics, Hollywood glitz or glamour. It's as if, by shedding the trappings of his character, he has stripped away any links he has to this role. Not in his opinion, though. "Why would I want to do that?" asks Mortensen. "Sometimes you'll hear somebody say, 'Oh, I didn't have any problems shedding the skin of the character,' or 'I did have a problem for a long time,' as if getting rid of it was the thing to do. But for me - and I usually feel this way about the characters I play - I think it's good to remember everything about them." "In my opinion, life's short and pretty soon we're all going to be senile and not remember anything anyway. So why make an effort to try and forget something that has been so important in your life? I don't get it, unless you hate being an actor, hate making movies and it's just about the money, in which case you'll probably not have invested yourself in the character enough to have to try and shed your skin!" Mortensen insists he hasn't abandoned any aspect of his character because being an integral part of The Lord of the Rings trilogy and filming in New Zealand for nearly four years has had a profound effect on him. In fact, he stresses that it has left an indelible impression on him physically, psychologically, philosophically and politically. "Peter Jackson said everyone involved [in these movies] would be really affected and he was so right," he murmurs. "I can see it in people's faces and their eyes from the snapshots I took of them at the beginning of this journey, in late 1999, compared to them now. Looking at those photographs and these films, there's a very obvious change in people's physiognomy that goes way beyond what happens to the human body in just four years. "There's a certain look in people's eyes; a look of being tested," he suggests. "Everyone has that look, even Peter, despite knowing what lay ahead, how daunting a task it would be. When you compare people's eyes from before with now, they have a look of being challenged and tested, not just aged. "There's also a certain calmness about everyone; an almost unburdened feel to them," continues Mortensen. "You can really sense that and hear it in the voices of Orlando [Bloom], Bernard [Hill] and Sean [Astin]. It's pretty strange." Mortensen's suggestion is intriguing but surprisingly accurate. After chatting to the California-based actor, Hill, Bloom, Astin, Miranda Otto and Andy Serkis, it's evident that they do all have a serene, almost scholarly air about them. It's particularly noticeable with Mortensen, who was presumably tested more than most by his pivotal role, especially as he was brought in to portray Aragorn at the last moment after Jackson axed his original choice, Stuart Townsend. How unnerving was that? "There were positive and negative aspects of coming into it so late but I'd rather not dwell on the negatives because the positives far outweighed them," he yawns. "Basically, it was like being thrown into the water and having to swim. But rather than gripe about it, I just tried to make the best of the situation. "Coming into it late was actually a positive thing, in one way, because I didn't really have time to get too nervous or to doubt myself. I just had to get on with it. Also, not knowing the book meant I didn't have a predetermined idea of Aragorn, which was helpful." However, because he's a true thespian, Mortensen repeatedly read the whole of Tolkien's trilogy before filming commenced, and continued re-reading it throughout the shoot to ensure he unearthed all his character's nuances. "After reading the books, I realised I already had some ideas about Tolkien's world because I'd read a lot of the Nordic mythology and literature that he drew on. That was helpful, especially coming into it last minute," he admits. "Being able to make associations between his books and Nordic mythology, Samurai culture, medieval poetry and Native American legends all added to my understanding of my character and Lord of the Rings." Another aid to successfully portraying Aragorn, the heir to the kingdom of Gondor, was Mortensen's own upbringing. Like his character, he is multi-lingual and has travelled extensively, having spent several years living in Denmark (his father is Danish), Venezuela, Argentina and the United States, when he was growing up. Consequently, his globetrotting has given him a unique world perspective and an appreciation of the myriad cultures that were crucial to playing the part. "I wouldn't say that someone who hasn't travelled is prohibited from being open-minded and playing this character. But speaking a few different languages and travelling a lot certainly doesn't hurt," he concedes. "Like me, Aragorn has travelled more than any other character, so he has more firsthand experience of different cultures, customs, languages, rituals, ways of thinking and even fighting styles, than anyone else in the story. It's definitely an advantage for him when he's trying to get everyone to follow him because he's able to relate to all the different people. "Despite all these similarities, the one thing that was most helpful in the end - and how we all managed to get through each day for the past four years - was what was right under our noses," adds Mortensen. "It was the support of this group of actors, the crew and especially Peter that was so important. Just knowing they were all there for you if you needed them was very reassuring. "It actually would have been feasible not to have even bothered reading the book because of that support," he half-jokes. "I could have simply spoken the words I was handed everyday and then, like a model, imitated what was going on around me! But that's not how I work and it wouldn't have been right because of the commitment everyone else was investing into these films. "There was such amazing commitment to this movie, despite the exhaustion, the intensity and everything else that was going on. I think you can feel that coming off the screen; you can feel the emotion and the effort that's being made," he enthuses. "I think it's so powerful because aside from the great special effects, it's also very human. You can sense the values of the people involved, the group ethic, their imperfections, the emotions, exhaustion and commitment. In 20 or 30 years from now, some of the special effects will still hold up but what will always hold up is the intention, feel, emotion, commitment and that palpable intensity." Mortensen admits the colossal commitment the cast and crew invested in all three Lord of the Rings movies spurred him on, even when he was physically and emotionally spent. Such attention to detail - and the intensity he instils in his role as Aragorn - was evident in previous compelling performances by Mortensen in Peter Weir's Witness, Jane Campion's Portrait of a Lady and Brian De Palma's Carlito's Way. It's equally apparent in his paintings, poetry and photography, which display the same passion and intensity as his acting. His dedication, determination and enthusiasm have ensured Mortensen a legion of fans. They have also earned him critical acclaim, from the moment he appeared in the risqué stage play Bent, which won him a Drama-logue Critic's Award. Now with his role as Aragorn in the Lord of the Rings trilogy, he's more than just a highly respected actor, he's also a household name and a hero. Did he expect that? "When I started this, I never thought I was going to end up as a major action hero," he laughs, clearly bemused by such an outcome. "Obviously, there was the possibility people could embrace these films but I don't think anybody really thought, with any certainty, that they would do as well as they have. They'd be lying if they said they did because nobody could know they would become the biggest movies ever. "Anyway, this whole thing isn't about that," he insists. "Essentially, Peter wanted to make a film that was a decent, heartfelt effort that did justice to the book and wasn't afraid to be emotional. I think he's done that in a big way! He talked about the storytelling in terms of compassion, mercy, sacrifice and the great characterisation of these books, rather than it being a Hollywood blockbuster. "Personally, one of the most valuable things I got from working on this movie was the importance of compassion, mercy and sacrifice. I already believed in those things anyway but I was reminded of their importance because those themes are constantly brought to your attention in this story. It's something we see when Boromir [Sean Bean] redeems himself, by literally giving everything, including his life, to save the hobbits. Until then, although he occasionally found them amusing, he'd had nothing but disdain for them because he didn't think they were very useful, since they couldn't fight. But he finally realises he's misjudged them and, in the end, learns the value of being open-minded and compassionate. "It's so easy to be selfish, to just think about yourself. But you have to make the effort to think about others and try to understand them - especially people you disagree with - because it's vital for [world] harmony," asserts Mortensen, alluding to the Gulf War and its aftermath. "There's no real future for any community that doesn't embrace the values of compassion and mercy, particularly toward people who are different or who you don't understand. "We actually have more in common with other people, other cultures and other races, than not," he suggests. "People need to make a conscious effort to try and find some common ground, rather than react to what they see as differences." Mortensen admits that living and working in New Zealand while filming Lord of the Rings strengthened his appreciation of how culturally diverse groups can interact harmoniously, despite their differences. It also highlighted how working together toward a common goal can reduce conflict. "The idea of putting the group first and the individual second, of serving others rather than getting others to serve you, is something that seems to come naturally to New Zealanders. That group ethic, which so much of Tolkien's story is about, appears to be inculcated in New Zealanders," he enthuses. "I don't know if it's out of a need for self-reliance or a need for cooperation, from being an isolated island nation, but it's something that really struck me while I was there. "So much of the story is about that principle, or tries to encourage it. But it's only through incredible obstacles, like war, that people of different colours, races and ages are brought together in the book. "In New Zealand, my experience is that it doesn't require a war, famine, plague, earthquake or flood to bring people together. It happens naturally. I think it's because New Zealanders are unique," proposes Mortensen. "They do things their own way, not just for themselves but also for each other and for the rest of the world. They have a concern about their environment because they've taken stock of their place in the world and how it links to the rest of the world. So if they don't want to have nuclear ships coming into their harbour, as historically has been the case, then so be it! That's an extreme case but on a day-to-day basis, that really noble, independent spirit that was once a part of America but has been subverted by politicians, is still alive and well in New Zealand." His admiration for New Zealand's pioneering spirit and the Kiwi 'can do' attitude, along with a genuine fondness for the country and its unspoiled beauty, meant Mortensen found it difficult to leave when filming for Lord of the Rings finally ended. "There was a bittersweet feeling when it came to an end because I enjoyed myself so much while I was there," he smiles. "I could try to share some of the special moments with you but it's the overall experience that means so much more to me. I've made friends for life with some of the people I met through Lord of the Rings and being in New Zealand. It's a wonderful country! Every time I pick up photographs, I remember something else because I enjoyed so many great moments and experiences there." Mortensen also fell head-over-reel in love with New Zealand because he's a keen angler. He particularly enjoyed wandering off into the wilds, looking for remote rivers to do a spot of fly-fishing. "There are some streams where the fishing's so good, I wouldn't tell you about them," he grins. However, on one of these safaris in the South Island, disaster struck and Mortensen nearly perished. "It was one of those rare times when I actually had the weekend off, so I headed off to the West Coast, into the rainforest, to a place I'd been to before," he recalls. "I was trying to get to the coast via the woods but it was a bit of a hike and it started to get dark. Stupidly, I hadn't brought a flashlight with me because I thought I knew the trail. But I soon got lost because there was no moon and I was in dense bush. It was pitch black but luckily I had a camera with me that had a flash, so I used the flash to try and find my way out. "I was taking pictures, using the flash to try and find the trail, because it let me see everything around me for a second. But I never did find it and then I ran out of film! At some point, I ended up in a marshy area and I kept falling down and getting cut by thorns. I just thought, 'This is stupid,' so I found a piece of relatively high ground and lay down for a while until the moon came up. "Fortunately, when the moon did finally come up, I managed to get my bearings and figured how to get back to where I started from," he recalls. "When I showed up, I really alarmed the makeup people because it looked like I'd been through a grinder!" That wasn't the only occasion Mortensen put his life at risk while filming. In fact, it happened on a few occasions while he was on set. "I can remember thinking, 'Oh, I could be dead,' a few times because there were a lot of situations that were dangerous. But there was one time I did come really close," he recalls. "It was while I was crossing a river with all my gear on. I got caught in the current and went straight to the bottom! I remember looking up, thinking it was a beautiful, sunny day. But then I started to black out. "At that point, I genuinely thought, 'This is it,' because it was pretty far up to the surface. But somehow I kicked against a rock and managed to get out of it. It was close, though. Of all the things that happened during this movie, that was the one time where I genuinely thought I'd had it." Unsurprisingly, those escapades have left a lasting impression on Mortensen, altering his view of life, death and his own mortality. "I think I'm more accepting of death now," he nods, soberly. "I'm not so resentful of the fact it's coming and that I'll run out of time to learn new things or do everything I want to do. At times in the past, I felt that was sort of unfair, like, who made that decision! "I don't know if it's specifically because of those incidents or just a combination of things," he shrugs. "Obviously, they have something to do with it but so has making these films because they've made me appreciate so many things. Maybe it's just a function of being a few years older and seeing other people suffer, get ill, age and die." Whatever the reason, these life-changing experiences, coupled with the principles and propositions in Lord of the Rings, have clearly affected Mortensen, judging by his notably solemn perspective. It's also why he strives for peace and steadfastly hopes for greater understanding, cooperation and compassion amongst all people, whatever their background. It sounds like utopia, so how does he propose to achieve it? "By making people understand that even the smallest person matters and that the smallest act of kindness can make a difference," he evinces. "You see that all the time in the movie, like with Sam and Frodo. They're just a couple of hobbits but if they succeed with their mission to take the Ring up Mount Doom, it will make a huge difference to everyone. "It's also about sacrifice, like when Sam literally carries Frodo up the mountain towards the end of the movie. That's one of the themes of the entire story; the willingness of the individual to make a sacrifice. Ultimately though, it really is about how each and every person - of the billions of people in the world - act and react to one another in ways that count," concludes Mortensen. "How we treat everyone else and whether we try to be compassionate or merciful is what makes a difference, what makes a community, and, ultimately, what makes society. That's pretty obvious but a lot of people will just say, 'Oh, yeah, that's all very nice.' But what else is there? That's something that this story is trying to tell you; that everybody has to play their part and do what's right. This movie has just strengthened my perceptions and convictions about that." And strengthened his resolve to try and do something about it too, it seems. "I think fate was dealing us a very kind hand because, in hindsight, Viggo was the one person who was perfect for this film. He just came out of nowhere and suddenly he was Aragorn. We found out that Viggo's son Henry, who was about 11 or 12 at the time, was a huge LOTR fan, and when Viggo mentioned to him that he'd been asked to play Aragorn, Henry said, 'Oh, you've got to do it, Dad. You've got to do it for me.' So at the end of the day, he did it for Henry." "Viggo's a leader, just by sheer dint of his personality. He's an example to us all. He's a massive work-horse, like a massive multiplex. You can go through one door and he's a photographer, then you go through the next door and he's a singer. Then you go and look at his poetry and his art and there's his films! I'm not jealous at all [laughs]. And he's just a great guy and my friend." "For me, Viggo is one of the heroes of the film and a personal hero, in that he's a great friend and someone I admire in his approach to making the film. He came late to the project and I think he brought a dedication and an understanding of the role that became an example, particularly to the younger cast members. Not only was he invaluable for his performance but he was invaluable as a leader of the cast." "At the end of shooting one day, we went out and had a drink and Viggo was just so encouraging of everybody he'd worked with, including the extras. He always had a kind word to say to everyone. And I don't know anyone who has a bad word to say about him. He bought flowers for all the extras on one incredibly rainy day. He was just really generous with his time but he never talked himself up. He's quite shy about talking about his own achievements. They were really lucky they got him for this. He kind of makes the film for me." "Viggo was amazing, fantastic. Aragorn was one of the hardest roles to bring to life because sometimes the leading roles can be the most mundane. They're always reacting to things that are happening around them. 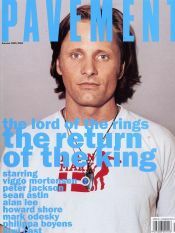 But Viggo's very truthful as an actor. He needs to know where it's coming from. He doesn't like manufacturing stuff that's not real to him, so you've got to respect that, even if you think it's a really good line! [laughs]"
"Viggo's our king. He's one of my favourite people in life. He's brilliantly talented in so many ways. An incredible photographer, painter, actor...And he's incredibly eccentric. He's just such a loyal, kind, sweet-hearted man who's hilarious to be around and inspiring in all the things he achieves and sets out to do. I've certainly learned a lot from him. His perspective on life is beautiful too. He's a real lover of nature and a very giving and accepting man. 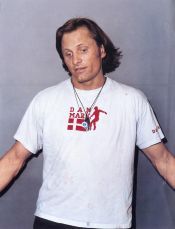 And there's something about Viggo that's absolutely, completely insane and I find that very endearing. He really is mad."